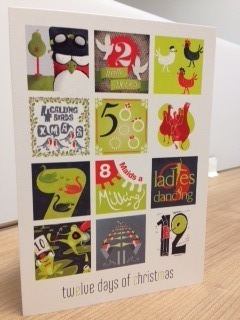 This year, emc’s Christmas card was inspired by the “12 Days of Christmas” song. We had twelve different emc-ers create a ‘tile’ for the christmas card, using one of the twelve days of Christmas as the basis for a typographic and/or illustrative design. Each emc-er was assigned a ‘day of christmas’ and had to stay within the same colour palette. This consisted of emc grey, emc green and festive red to tie in the Christmas theme. We then had it printed on gorgeous Sirio Polar Pearl 300gsm card. The final cards are winging their way to clients and suppliers as we write – we hope you all like them!